From left to right we had representatives from Vietnam, Hong Kong, and Korea. 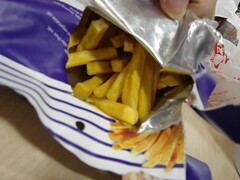 The Vinamit Vietnam sweet potato snack was cut like french fries. Unfortunately, they were a little stale and fried to oblivion. Our teeth had a good workout just chomping on these snacks. The sweetness of the sweet potato was also lost. 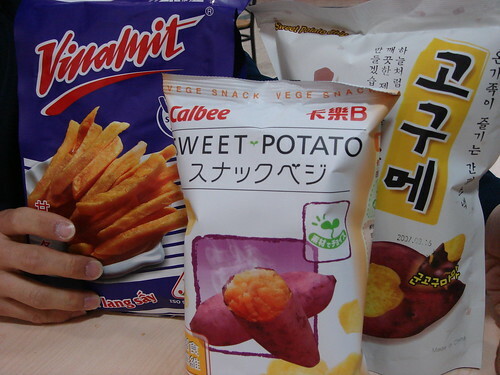 I had so much hope for the Calbee sweet potato crisps. 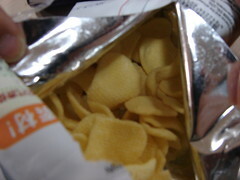 Calbee was my childhood favourite for potato chips but these reconstitute crisps simply had too much fillers. It would be best described as a sweet potato flavour crisp at best. When I opened the bag, it smelled delicious. Unfortunately, that was the best thing about this snack. The last candidate of our taste-off came from Korea via China. The packaging was full of Korean characters so I could only imagine that it was sold in Korea. 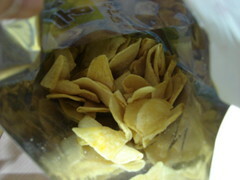 However, a more detail look at the labels reveal that these chips were made in China. No matter...because these are the clear winner in our taste-off. The chips were obviously thinly sliced sweet potato deep fried to delicious crunchiness. The sweetness of the sweet potato was preserved. That was exactly what we were looking for. After a taste, my friend ran right back to T&T and bought a few more bags of these chips to stock up. They were truly tasty. Jacob's Orange Club biscuit is one of the rare milk chocolate treats that I crave. When I was a kid in Hong Kong, receiving a box of this gold ingot during Chinese New Year was one of the reasons I looked forward to the yearly celebration. Fast forward to present, the classic combination of chocolate and orange still evoke memories of those delicious biscuits. For the March dessert special at Linda, I decided to make a layered dessert which highlights the contrast of sweet and tart, smooth and crunchy. 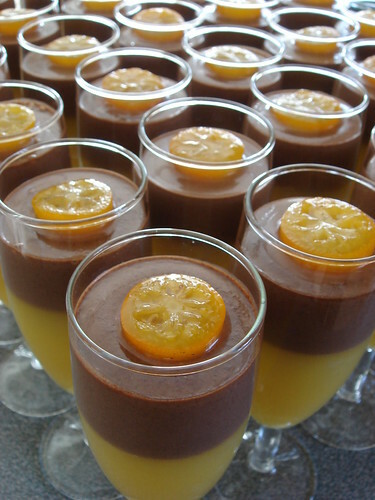 This Coupe de Chocolat et Agrumes (more pictures available here) consists of a layer of orange Grand Marnier gelee filled with pomelo segments and a layer of smooth deep chocolate cream. A candied kumquat garnish topped off the dessert with another dimension of the citrus theme. Bloom the gelatin with about 125g of water for five minutes. Heat in microwave using 10 second intervals until it becomes a clear liquid. Heat the first portion of orange juice to lukewarm using the microwave. Stir the melted gelatin into the orange juice. In a large bowl, mix together the remaining orange juice with Grand Marnier. Stir the gelatin orange juice into this mixture and strain with a fine sieve. Divide the pomelo segments into 21 champagne flutes. Divide the orange juice mixture into the flute. Chill until set. Make a creme anglaise. In a heavy mixing bowl, whisk together the egg yolks and sugar. Scald the milk and cream in a heavy saucepan. Temper the yolks with the heated cream. Cook until the custard reaches 180F. Strain the custard. Place the chocolate in a large mixing bowl. Pour the creme anglaise over the chocolate and stir slowly until the chocolate is melted and smooth. Cool in an ice bath until the mixture is about room temperature. Pour over the chilled orange gelee. Chill in refrigerator until ready to serve. In a heavy saucepan, make a simple syrup using the water and sugar and heat to a boil for about 5 minutes. Put kumquats into the boiling syrup and reduce to a simmer. Simmer until the kumquats are somewhat transparent and glossy. When ready to serve, garnish each flute of dessert with a candied kumquat half. Enjoy! A couple of years ago I went to see Karen Hines' monologue Pochsy Unplugged and totally fell in love with Pochsy. I was looking for her tour schedule today on her website. Though there is currently nothing scheduled in the foreseeable future, I did find the complete audio recording available for listening online. I listened to it today and it absolutely reminded me why I enjoyed the monologue so much. If you enjoy dark cynical humour, I would highly recommend you to give it a listen. CanStage's production of The Rocky Horror Show will open next week with a midnight showing preceded by a party. I'm looking forward to see this show but am a little disappointed that there are MANY rules that restrict audience participation. No rice, no toast, no confetti, no watergun, no throwing things in the air...half the fun is already gone! I was originally very excited about going to the midnight show and even invited a bunch of my friends to go...but now I'm not so sure. From the sound of it, it's going to be a very tamed show. 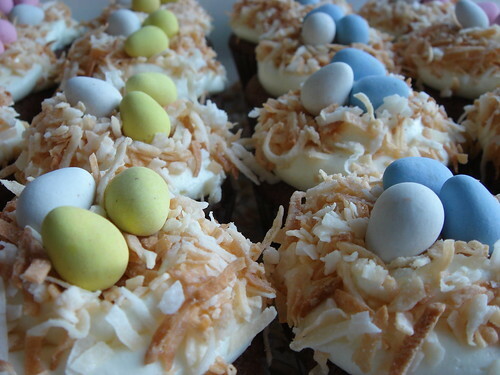 If you like kitschy ideas, these easter cupcakes (more pictures available here and here) will for sure appeal to you. 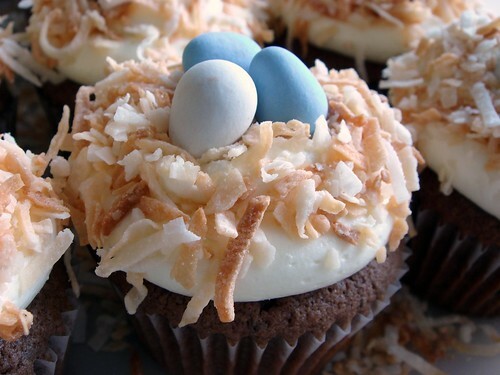 I've been meaning to make cupcakes decorated as tiny birds nests for sometime but one of the key ingredients, Cadbury Mini Eggs, is not available except around Easter. After a few months of anticipation, I finally got my hands on an economy-sized bag and an occasion to bake. The cupcakes are simple chocolate pound cake topped with a white chocolate cream cheese frosting. I love the tangy taste of cream cheese frosting. Actually, this is one of my favourite frosting because it is so easy to make! It was a blend of cream cheese, white chocolate, butter, and lemon juice...no cooking required. If you're not into white chocolate, you can check out my recipe for cream cheese frosting too. The frosting was covered with lightly toasted shredded sweetened coconut. Of course, the final touch was a few nicely placed Mini Eggs. My friends SZ, AH, and ARA will be racing in Asia and Europe this summer so it will be some time before we get to skate together again. For their going-away party, I think these birds nests cupcakes are, in a way, very appropriate. They remind me of spring...a new beginning. I wish them all the best in this new adventure and I'm looking forward to hear all about their experience. For more Easter treats, check out my Hot Cross Buns, Spring Brunch Menu, Almond Tea Cake with Tangerine Glaze, Chocolate Coconut Cream Pie, and Mango Coconut Carrot Cake complete with Easter Bunny topper! I don't live to please but things that my close friends and family say to me matter a lot to me. In recent times, some of these well-meaning comments and criticisms are causing me some confusion and I'm not sure what to make of them. I don't necessarily agree with all of them but I suppose they do reflect fragments of how they perceive me. Sometimes, my inner voice protests loudly with "you're not me, how can you possibly tell me what I am feeling?". At other times, my judgement whispers "perhaps they do know best with the perception of a unbiased observer". Some comments are obviously harder to swallow than others. The voices stay in my head for months at times. I continously question myself am I upset by the comment because it is not true? Or perhaps because I cannot face up to any criticism? Or may be because it conflicts with my own more idealized perception? The person who made that comment, how well does he/she know me? How much is he/she aware of the entire situation? That is a lot of questions that just wouldn't go away. All of these voices in my head culminated to a few resolutions that I made today. One of which is that I want to be a more likeable person. I do that by first being more judicious of what I say. Navel-gazing should be a private activity at best and honestly, nobody needs to be subjected to such boring details anyway. It just occurred to me today that my approach to life is one of the reasons why things turned out the way they turned out. Instead of allowing my life to unfold and welcoming people into my life, I have a grand masterplan. I have very clear objectives to achieve. I try to achieve these objects by engaging in activities, meeting people, and changing the way I think. Everything that I do is an attempt to put a missing piece of puzzle in the big picture which I believe is the way I should end up. Along the way, I kick people out of my life who don't fit the criteria...instead of letting them in and see how my life would change because of them. I also weed out emotions and feelings that make me feel inferior. I am very determine to get what I want for the sake of determination. Objectively speaking, this is a very foolish way of living. I know that I am on course to get what I want in the most efficient manner. However, things that I want, are they really things that I need? I'm not very sure sometimes and I am contemplating this issue now. However, typical of me, I can quickly reason my way out of my doubts so that such moments of hesitation usually don't last for long. I don't think I would like to change my approach. However, realizing that it may be the root cause explains a lot. I am able to navigate through my life efficiently and in a relatively painless manner. I need this unwavering conviction that I am heading in the right direction more than ever because I'm starting to realize that history is repeating itself. It is especially true if I keep on getting involved with people who prefer to react to what life throws at them. Never have I imagined that I would look at a box of absolutely delicious truffles from Teuscher and feel sad. I received this belated Valentine's Day gift not too long ago. What made me really happy was not that it was from Teuscher, rather, it was the fact that he remembered my preference for chocolate from previous conversations. Key to a girl's heart is to pay attention. I have taken my time to savour these truffles, enjoying at most one piece a day. Unfortunately, it made me very very sad today to realize that I have yet to finish these chocolates. Chocolate can be very bitter when mixed with a cocktail of sadness and disappointment. The taste of these chocolate melting in my mouth used to fill me with joy and contentment. It was a feeling of knowing that someone was thinking of me. However, it is now replaced by a sense that I'm all hollow inside. Food can ilicit such powerful memories and feelings...no wonder Proust and his madeleine have been praised over and over again. Was it stupid of me to tell you of my priorities? I must say it is a resounding yes. However, I dont' want to be deceiving nor do I want to give you illusions. People often ask me why am I so certain of my priorites because after all, priorities can chanage over time. All I can say is, at this point in time, I cannot visualize in any forseeable future that I would change. The reality of your decision hasn't hit me yet so I'm still living in that blissful void before I fully realize how much it hurts. It's not unlike that rush of adrenaline when I fall and can't feel the pain from the wounds yet. Perhaps I really shouldn't have told you...it would have been wonderful to bask in the warmth of a budding relationship for just a little longer. However, I know very well that it would simply be borrowed time and the inevitable moment will arrive when I break under the beating of my conscience. I do not want to mislead you. Too much happened in this last weekend. The amazing time we spent together only made this recent change of event all the more difficult to bear. Stupid stupid me.